Ismaaiyl Brinsley: New York police killer was known as unstable and dangerous. 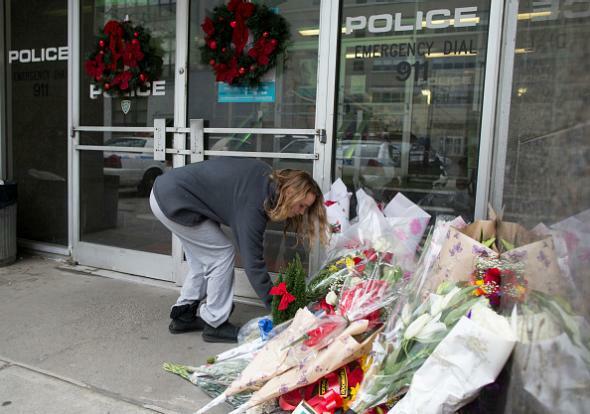 Flowers outside the 84th Precinct building in Brooklyn where officers Wenjian Liu and Rafael Ramos worked. No members of his family spoke of Mr. Brinsley with fondness. He bounced from family home to family home growing up, attending high school in New Jersey but reaching only the 10th grade. A sister in Atlanta, Nawaal Brinsley, said she had not seen him in two years. Another sister who had lived in the Bronx could not be reached, but the police said they had been called to a dispute with Mr. Brinsley at her home in 2011. Mr. Brinsley’s mother, who lives in Brooklyn, told the police she feared her son and had not seen him in a month. She said “he had a very troubled childhood and was often violent,” [New York chief of detectives Robert] Boyce said. Brinsley shot his ex-girlfriend Shaneka Thompson in Owings Mills, Maryland, shortly after 5:30 a.m. Saturday before taking a bus to New York, arriving in Manhattan around 11 a.m. Police were able to track him via Thompson’s cellphone, which he took from her residence and used to call Thompson’s mother to ask for updates about her daughter’s condition. (Brinsley reportedly told Thompson’s mother he shot Thompson by accident. She’s in “critical but stable condition” and is expected to survive.) He dumped the phone near Brooklyn’s Barclays Center around noon. Baltimore police faxed a wanted poster depicting Brinsley to New York police, but not in time to locate him before he shot Liu and Ramos at 2:47 p.m., then killed himself.